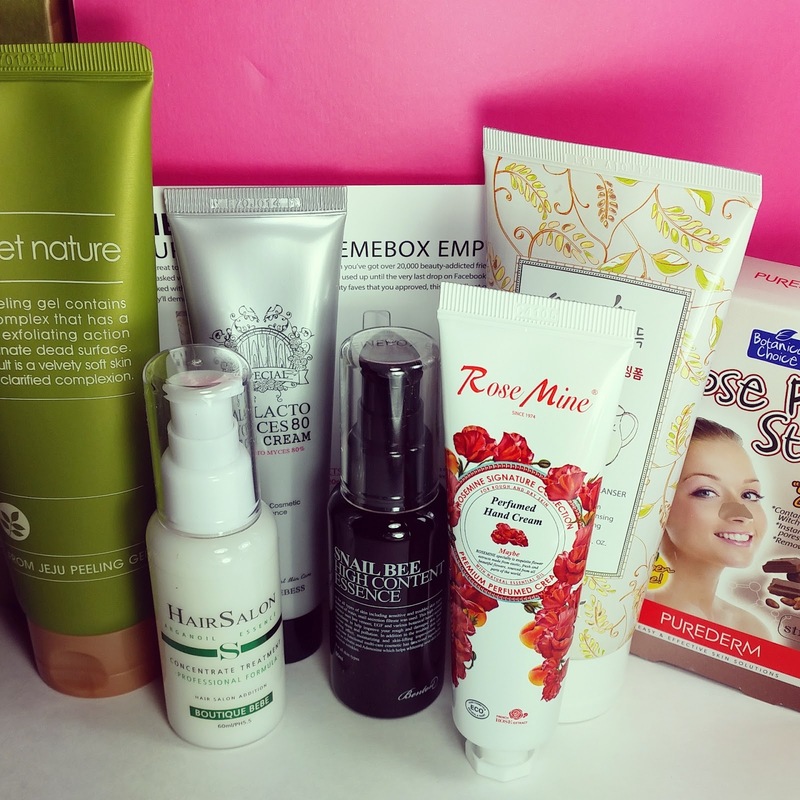 I figured I needed to get to a review of my Memebox Empties before I'm completely swamped. I have so many Memeboxes coming from my splurging in October. Besides Empties, I have Blogger's Picks and Green Food Cosmetics in my sitting room waiting for me to get on it. Tomorrow I have Memebox Apple Mojito and Blackout showing up. So it's going to be a little Memeboxy around here for a few days, I hope you don't mind! After this flush, there will be far fewer. 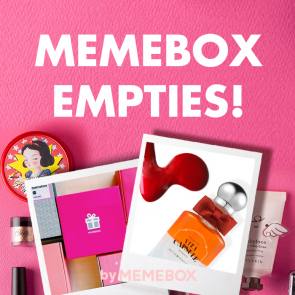 There has been a dearth of boxes available and it looks like Memebox may be switching gears. I'm not happy about that since I love their boxes but we will see what really ends up happening. On to the box! Empties is a Superbox which means it contains only full size products and cost $29 plus shipping. The contents were chosen based on an informal poll taken by Memebox on their Facebook page. They requested to know which products from Memeboxes had customers already used up because they loved them so much. While I think they did stick to some of the answers, there's no way anyone used up an eye cream the size of the one included in this box! I will tell you right now that I think this box is great. I think this box is what Blogger's Picks *should* have been. Blogger's Picks was a terrible box, btw. I'm currently writing up my rant. Empties, though, is very well curated and it contains my FAVORITE thing ever- the Benton High Content Snail Bee Essence! If you got this box, I hope you love this product as much as I do. 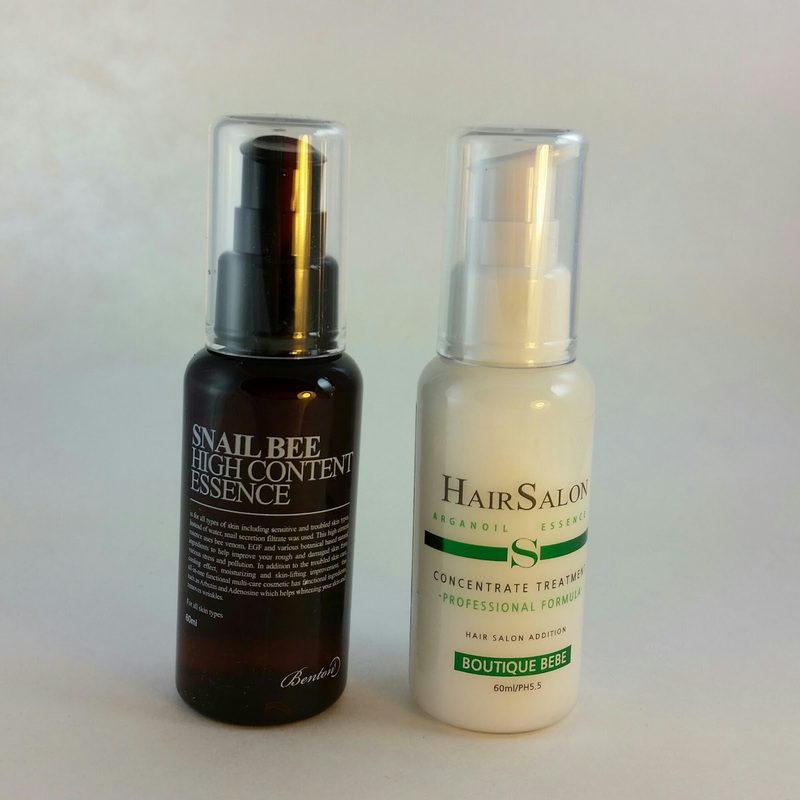 Benton High Content Snail Bee Essence- I have to start with this because it's one of my HG products. It's the first thing from a Memebox that I purchased more of outside of a box. This uses snail secretion filtrate, bee venom and EGF to soften, moisturize and even out and brighten your complexion. Apply generously and pat in. This really does what it says, too. It leaves my skin so soft and bright. It's the one thing I feel like I can use in a hurry and get away with. I use it every day. The ingredients are very good, too. I didn't find the ingredient list in English until after I had started using it but seeing them explains the awesomeness of this product. It's got 90% snail ferment filtrate and it's used in place of water. This is a clear gel serum, it's a little thicker than some but not too much and it spreads quickly and easily. Snail Secretion Filtrate is good for those who have troubled or acne prone skin because it's anti-microbial all on it's own and that's not counting its proteins, elastin and glycolic acids that it contains! It also has aloe (antiseptic, wound healing), Human Ogliopeptide-1(stimulates skin cell regeneration for wound repair), Bee venom has less evidence behind it but supposedly helps stimulate collagen production and increases blood circulation. So this is basically a skin renewing, soothing essence that I'm pretty sure you want to try unless you're allergic to bee stings. Boutique Bebe Argan Oil Concentrate Treatment-60ml- Ew. Hair stuff! I've got so many of these now, I should probably just try it. I don't even know why I have such an aversion to hair product. Maybe because its a nuisance? Either way, this is an argan oil essence that delivers hydration and nutrition to your lank, lusterless locks. Oo, I alliterated! The card actually says "dry and crumbly hair". I'm... not sure what that means so I'm going with my version. It looks like you apply this to dry hair whenever you feel like it. 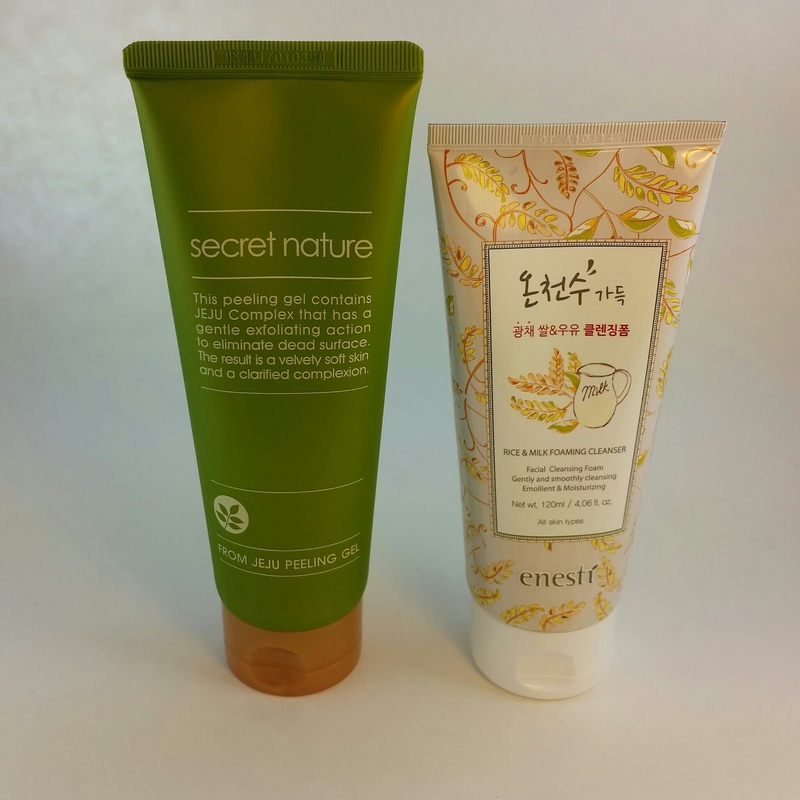 Secret Nature From Jeju Peeling Gel-150ml- This is made from volcanic clay, cellulose components and will exfoliate any dead skin cells left over after your initial cleaning. Apply to dry skin and massage in. It will pill up as you rub, collecting any impurities. If it turns gray, it worked. If it stays whitish then you know you already did a good job cleaning your face in the first place. You gave yourself a nice exfoliation, though. Enesti Rice and Milk Foaming Cleanser-120ml- A foam cleanser mad from mineral rich hot spring water and packed with rice and milk extracts. Make a lather and apply to face to clean out your pores and apply a little hydration action. Wash off and move on to your next step in your skincare. I'll use this. I like getting cleansers in my boxes, although I don't think I use them fast enough. I had to put some in the shower and use them as an all over body wash or else they'll just last forever and I can't move on to the next one. Yes, I have product overload. 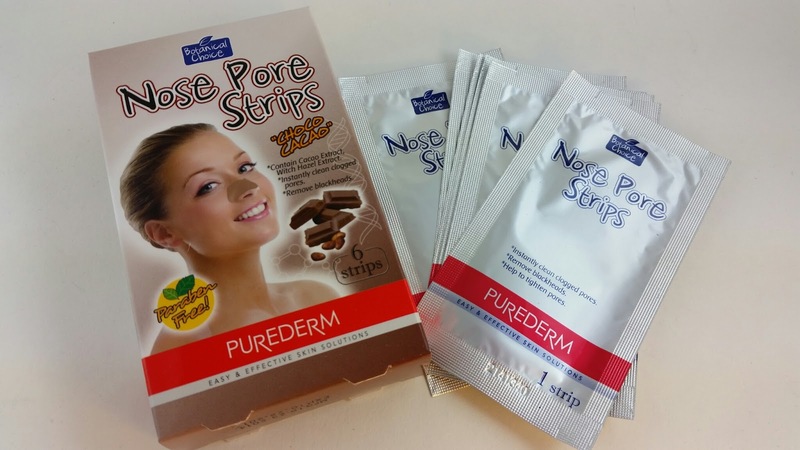 Purederm Botanical Choice Nose Pore Strips in Choco Cacao- These were in the first chocolate box and I remember everyone raving about how they were so much better than Biore. So I bought some while they were on sale for $2 a box. Because Biore is expensive! I bought 6 boxes. Now I have seven. Haha! This is why I should never buy anything in the Memeshop! I should have taken a picture of these out of the package. They are brown. And they smell like chocolate. You'll want to eat them. But don't because you'd rather use them to clean out your nose pores. They work great and they didn't rip my skin off. I like the Purederm brand and I'm happy with these. 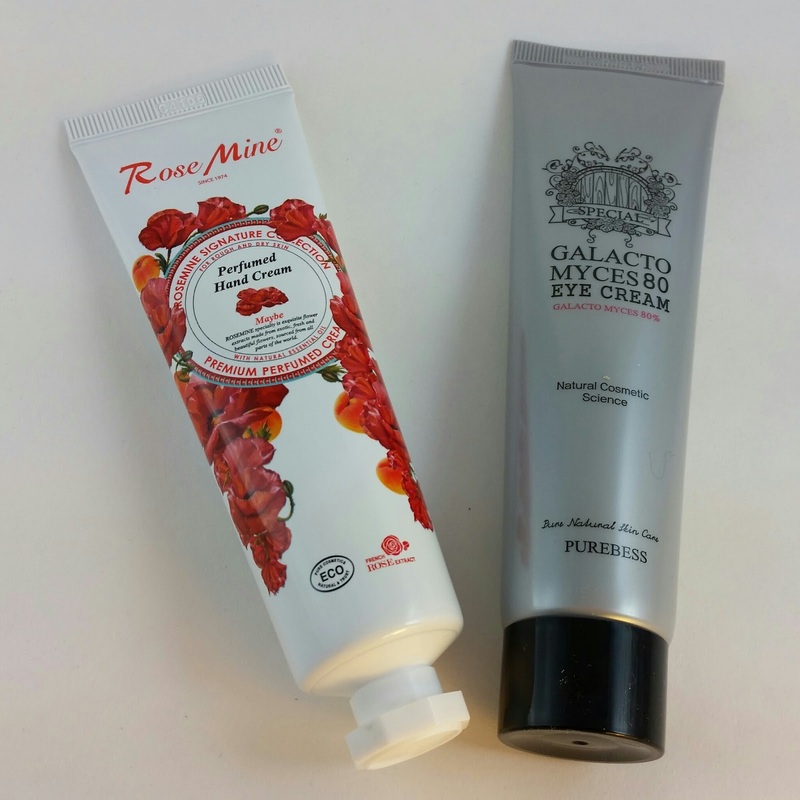 Evas Rose Mine Perfumed Hand Cream-60ml- There are three scents and I got Maybe. Again. The other choices are Gleaming Bijou and Musk & Musk. Maybe is a fruity, floral fragrance with lychee, apricot and poppy notes. It's too flowery for me. It makes me think of soap. I don't care for that type of scent. VERDICT: Empties is actually a great box. I was worried they'd fill it with rejects but they didn't. These are actually good products and get nice reviews from people who have used them. Plus with the Benton essence in it, it's going to be worth it to me for sure. I know I never tend to put values on these boxes because pricing is just so weird with Memebox and if you can find it anywhere, there's shipping to take into account. But think of it this way, you paid $5 for each item in here. Worth it? Yes. For me, there are two things I wont use, the hand cream and the hair treatment but the Benton makes up for that. So does the Purebess. Oh, and the Enesti face wash, I want to try that, too. Alright so now I just made my valuation confusing. In any case, this was worth it for me and I did use points so it's even more worth it. Hi u mentioned your blackout box is being delivered tomorrow please pplease do a review on it. I really can't wait to c whats inside that box. Everyone is always talking about how it takes them so long to use up an eyecream... I find that weird since I go through them like crazy! I constantly repat cream on my eyes whenever I can (when not wearing makeup). Omg peeling gels! I love actually seeing the uglies coming off my face and if that happens to be in the form of gray rolly pills I'm game. The hair treatment works fine, but the more I use it the more I can't stand the smell. It's like they forgot to add a fragrance in there and it just smells like straight up unscented lotion. LOL! I hate hair treatments. I don't know what my issue is with hair stuff but I rarely use them. I did just use the shampoo from the Green Food box and the whole time it felt like I was washing my hair with dill. And there isn't even dill in it! I'm totally with you on peeling gels. I love them! And they're less messy, too. I mean it's nice that you can just brush off the pills into the sink, then swipe around with a cotton pad and toner and be done. :D I have a Snail Grommage one that I like but my most fave is still the ridiculously priced Sonya Dakar one that I would never actually buy. (thank you, fabfitfun). I am so pleased that they included the hair essence because that was my suggestion - I even fished it out of the bin to take a pic of the empty bottle. Didn't win any points though, and didn't buy the box as my Memetrust was at an all time low when it was released. Still, I'm glad this box has turned out well when so many of them lately haven't been so good. If you can bring yourself to try the hair treatment, it leaves the hair really soft. If those pore strips really smell like chocolate then I want them! I got some charcoal-ish smelling ones by Purederm in another box... terrible scent, but they did work and you can't really beat the price. Oh, yes. They definitely are chocolate smelling. And right next to your nose.... Mmmm!